Google has launched a controversial new tool that allows the public to comment on any web site in a side bar displayed in their browser. Called Google Sidewiki, the tool is integrated in the latest version of Google Toolbar and works with both Firefox and Internet Explorer but ironically, not yet Google Chrome. 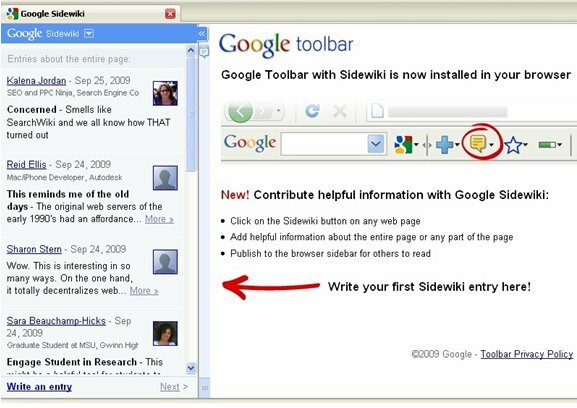 To use Sidewiki, download the latest version of the Google Toolbar and set it to enhanced. When activated, Sidewiki slides across from the left and becomes a browser sidebar, where you can write entries in a vertical column and read the entries of others. To activate Sidewiki, you simply click on the Sidewiki button in your Toolbar menu or the little talk bubble on the left hand side of your screen. If you’ve got a Google profile, your image will appear next to your Sidewiki entry. You can either highlight a certain part of a web page, click the Sidewiki button and comment about it, or you can make a general comment about the entire web page. If you’ve got Sidewiki installed, you can see comments made on the same web site by other members of the public and you can forward your Sidewiki comments to colleagues, friends and family via direct link, email, Twitter or Facebook. It appears that persons can read the Sidewiki comments sent via link whether they have Sidewiki installed or not. When you’re logged into Sidewiki, you’ll always see your comments at the top and any others below. The technology used to determine ranking involves large-scale graph computing but other factors are at play, as revealed by Danny Sullivan in his post about Sidewiki. These include use of sophisticated language, complex sentences and ideas, user reputation and user history as revealed by your Google profile and comment contributions. Your comments and other can be thumbed up or down using the “useful – yes or no?” tool, or reported as abuse, further contributing to your user reputation and “Profile Rank” as Danny calls it. Google have also launched an API that allows developers to work freely with the content created in Sidewiki. Where no comments have been made on a web page, Google may show blog results relating to that page. The potential applications of Sidewiki are interesting and frightening at the same time. For example, I can see how it could be a useful bookmarking tool, allowing you to make notes about a web site you’ve found which you could refer to later. You can even embed YouTube videos in Sidewiki (take a look at the Google home page to see this in action). It also has fantastic potential as an online collaboration tool, letting you annotate the pages on a site in conjunction with team members in a similar way to tracking changes in a MS Word document and sharing document versions via Google Docs. BUT, (and it’s a big but), I can see Sidewiki being open to abuse in a similar way to Searchwiki, Google’s comment tool for search engine result pages. Searchwiki has been widely panned in the search industry because it’s Notes feature has been exploited by spammers, overactive PR companies and people with a chip on their shoulder about certain web brands. Unfortunately, I see Sidewiki heading in the same direction. And fast. Any user controlled element of a search engine is open to some level of abuse. But I don’t see a huge amount of comment filtering going on yet and have already seen evidence of spamming (view the Microsoft home page with Sidewiki installed and you’ll see anti-MS entries like this one). Yes Google have a usefulness rating system in place, a Report Abuse link and are flagging some comments with the disclaimer “These entries may be less useful” but I doubt their filters will be able to keep up as Sidewiki takes off. There’s also going to be the troll factor which will undoubtedly lead to the system becoming worthless if it’s not carefully controlled. I’ve viewed Sidewiki entries on some major sites this week and it’s already starting to feel like Toilet Wall Graffiti 2.0. Sidewiki has program policies but spammers don’t care about those and trolls don’t read them. Besides, one man’s graffiti is another man’s gospel. Google’s catch phrase for Sidewiki is: “Contribute helpful information to any web page”. To that, I say: Define helpful. Article by Kalena Jordan, one of the first search engine optimization experts in Australia, who is well known and respected in the industry, particularly in the U.S. As well as running a daily Search Engine Advice Column, Kalena manages Search Engine College – an online training institution offering instructor-led short courses and downloadable self-study courses in Search Engine Optimization and other Search Engine Marketing subjects.